Bread & Butter Theatre’s “The North Pool” combines great acting with power dynamics, race, and suicide. 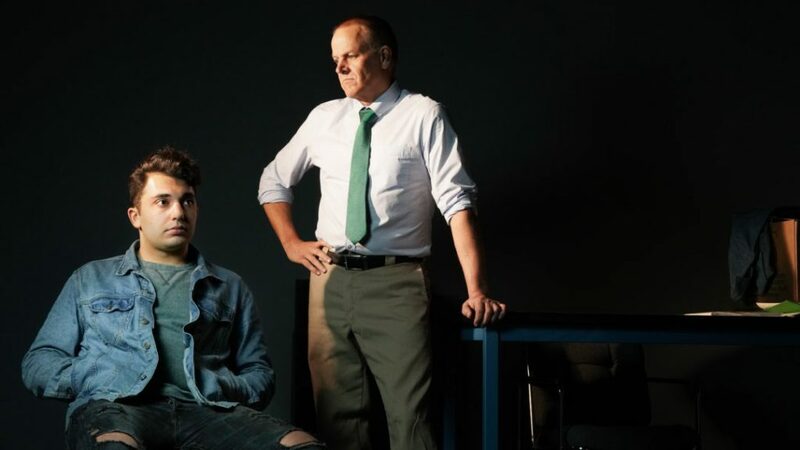 Rajiv Joseph’s gem of a ‘two-hander’ pits an Arab-American high school student against a shifty, overbearing white Vice-Principal. 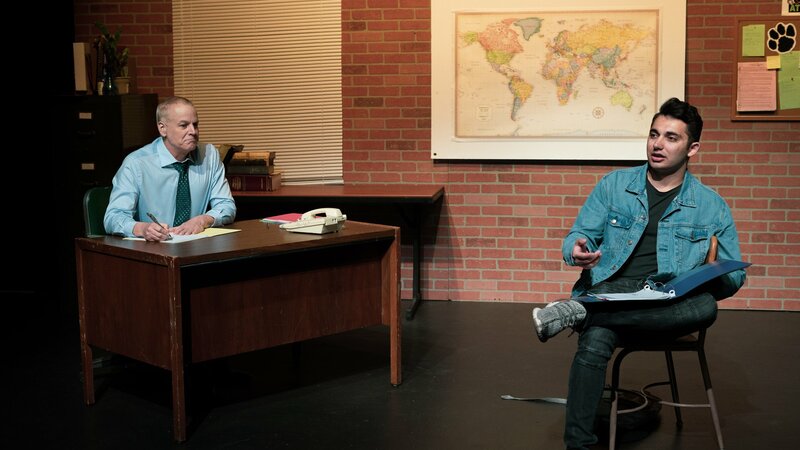 Dr. Danielson (electric Bruce Avery) invites bewildered student Khadim (versatile Zaya Kolia) into his bare-bones office for a “chat.” Along with Khadim, we struggle to understand why he has been summoned at 4:00 p.m., when everyone else is leaving for Spring Break. Dr. Danielson seems to be setting an elaborate trap for Khadim, who remains patient and diplomatic. At times, it seems that the Vice Principal is trying to befriend Khadim. But we all squirm as Dr. Danielson harasses the student with veiled threats, like: “I’m not trying to be a tough guy here.” His patronizing attitude evokes uncomfortable laughter from the audience. Yet, Khadim cannot wriggle out of the manipulation from Danielson, who seems to enjoy exerting his power. It is painful at times to witness Danielson’s racially charged abuse of power. The two brilliant actors hold us in their grip from moment to moment—we are all in it, together. 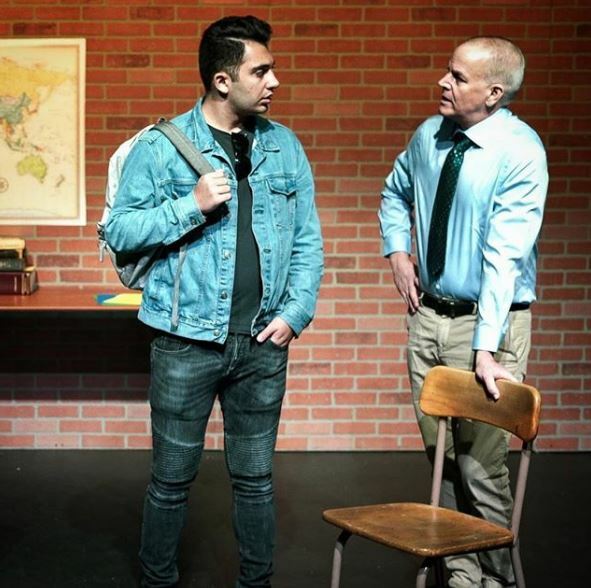 Award-winning playwright Rajiv Joseph presents the all too common scenario of a white authority figure humiliating a student of color. Danielson flings false allegations, while the student is forced to keep his cool, despite ridiculous, and downright funny, accusations. In a voice dripping with superiority, Danielson has the audacity to say, “I’m asking you this as a friend.” The frustration builds in Khadim and in us, too, as Danielson blatantly baits the student. Is he accusing Khadim of building a bomb or vandalizing the school? Khadim finally gets frustrated and courageous enough to stand up and call out the accusations as racist. We are rooting for Khadim every step of the way, so far. But something else is at work here, and the dynamic begins to change, as new facts and relations emerge. Dr. Danielson’s abuse begin to wane, and the dynamic begins to shift. We are hypnotized as new secrets emerge along with an unstated connection between them that involves another student—with whom they are both intimately involved. Things are not what they seem. Zaya Kolia & Bruce Avery. A secret is hidden behind a map on the wall–that links the secret obsessions and workings of U.S. culture with these two opponents. Danielson tries to connect with Khadim in his tense, up-tight, and over-heated American style. Tension builds, as we wait, breathlessly, for the next reveal. Finally, we discover why Dr. Danielson singled out Khadim. They both unveil surprising confessions, and we partake in their secret lives. We partake in their secret lives and newly forged connection. Fascinated, we feel secure in the hands of two masterful actors, who never let us down. 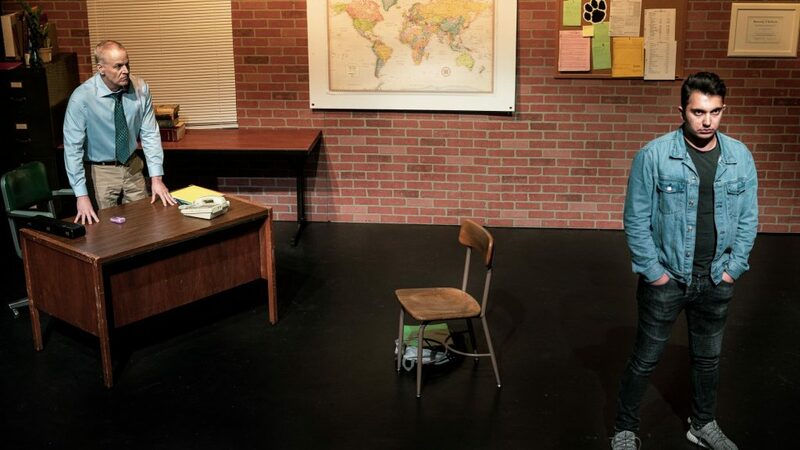 In that simple school room, Rajiv Joseph explores love, privilege, and the struggle for self-forgiveness. Get ready for surprises. Cast: Bruce Avery and Zaya Kolia. Arab American, bullying, class, culture, exploitation, high school, Imperialism, love, power dynamics, race, teacher-student, U.S.